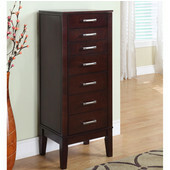 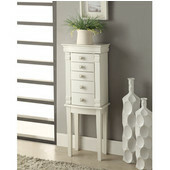 This armoire has a flip top which features a mirror for easy accessorizing. 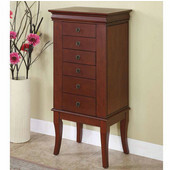 Wall-mounted and freestanding jewelry cabinets provide a luxurious alternative to the traditional jewelry box. 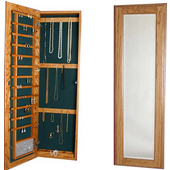 Wall-mounted jewelry cabinets offer elegant organization for necklaces, rings, and earrings and are the perfect choice for smaller spaces, because they have a slimmer profile and don't take up any floor or table space. 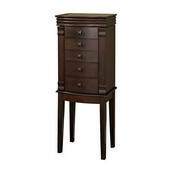 An exquisite piece of furniture, the jewelry armoire features multiple storage compartments to accommodate a variety of jewelry in all sizes and shapes while adding to the decor of a room. 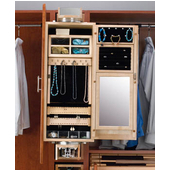 Jewelry organization can be easy and beautiful with a wall-mounted jewelry cabinet or a jewelry armoire from Powell, Linon, Jewelry Solutions, or Rev-A-Shelf.